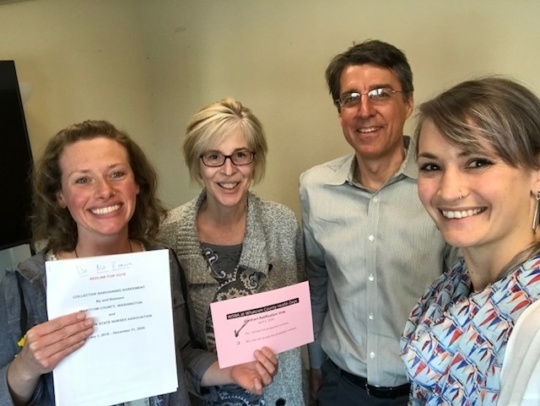 Whatcom County WSNA represented RNs have ratified the contract by an overwhelming majority of “YES” vote! Thanks to all of you who supported our negotiation team. And thanks to all of you who voted! We are strongest when we stand united. 1.0% (effective first full pay period in July, 2020). PLUS, the amount of the step increases for Steps 9 and above will be increased to .5%. The effect of this is that nurses at Steps 9 and above will receive more than the initial 2.5% increase. Medical Insurance. For plan year 2019, the County will pay $1,297 per month toward health insurance. For plan year 2020, the County will pay $1,362 per month toward health insurance. Membership and New Employee Orientation. The WSNA membership requirement language will be updated to comply with new federal law. New hires will receive up to 30 minutes of paid time to meet with a WSNA representative to discuss the Association. Public Information Requests. New language stating that if the County receives a request to obtain the personal information of nurses in the bargaining unit, then it must notify the Association. Sick Leave. New language stating that sick leave can be used to care for a child regardless of the child’s age, or for a grandchild, or for a sibling. Sick leave may also be used when a child’s school or place of care has been closed for health reasons. New language stating that the County may not require verification of illnesses for three days or less. We did agree to remove the language that allowed nurses who had more than 960 hours of sick leave to receive a Retirement Health Savings contribution for the hours above 960 hours. This provision affected very few nurses. State Paid Family and Medical Leave Program. New language stating that nurses will be eligible for the new State Paid Family and Medical Leave Program when it comes into effect on January 1, 2020. .9 FTE Pilot Program. Nurses will be able to apply to the program for the life of the Agreement. Your negotiating team worked hard during preparation and the four negotiation sessions to get you a fair contract. Please welcome WSNA Nurse Representative Sue O'Donnell, MN, RN! Beginning Monday, Dec. 10, 2018, Sue will be taking over all issues as they arise at Whatcom Health Department. I will be assisting Sue with this transition in the coming months as needed. Sue can be reached at sodonnell@wsna.org or at 206-575-7979, ext. 3045. It has been a pleasure working with you. I am continuing my work here at WSNA as a nurse representative with new assignments. I know you will be in good hands with Sue. The current contract between WSNA and your local unit expires December 31, 2018. Your negotiation team needs everyone to take the negotiation survey to know what is important to every nurse. This is how we draft and prioritize our proposals. It is what enables us all to be represented at the bargaining table. Take a moment to complete this survey now. Our power comes from our willingness to stand together in unity. Please provide us with your most up-to-date contact information in the survey. It is only collected so that your team members can contact you if questions arise and to share important information with you regarding progress and issues in negotiations. WSNA and your negotiating team members do not share this information with anyone. Questions? Contact WSNA Nurse Representative Barbara Friesen, MS, BSN, RN at 206-575-7979, ext. 3056 or at bfriesen@wsna.org. Congratulations to the newly elected officers of the WSNA/Whatcom Health Department Local Unit! Please drop in and bring any questions, concerns or just to say hi. Change in Nurse Representative: Barbara Friesen, MS, BSN, RN is returning as your nurse representative. She can be reached by phone at (206) 575-7979, ext. 3056 or by email at bfriesen@wsna.org. Contract ratified! Wage Increases are on the way! Your WSNA contract was ratified by an overwhelming majority on March 8, 2017. Thanks to all of you that came to vote! The County Council signs the agreement on March 21, 2017. Your wage increases will begin on pay period #7, March 26 - April 8. Payday #7 is on April 14, 2017, which will include your retroactive wage increases. For any questions, please contact your WSNA Negotiating Team Members, Elizabeth Allen or Erin Schuldt, or WSNA Nurse Rep Hanna Welander at (206) 575-7979, ext. 3035 / hwelander@wsna.org. The contract vote summary is available for review prior to the vote here. The changes will be presented and explained by the WSNA attorney and Negotiating Team members on Wednesday, March 8, 2017. The vote is from 12:00-1:00 PM in the State Street Downstairs Conference Room. Copies of the summaries and redlined (legislative) versions of the contract will be available for review. See you there.